Soon to be released! The Episcopal Video Network (EVN) is a fun and accessible how-to guide for parishes, for developing and using video as a tool for evangelism. VTS senior Christian Anderson used his background in acting and production in LA, plus a summer internship with Trinity Wall Street’s video department, to develop EVN in collaboration with a team from his field parish. Anderson believes that his work will empower parishes to clarify their message and share their story digitally. 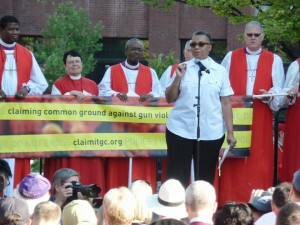 Fisher-Stewart speaks at the Bishops’ Rally Against Gun Violence, 78th General Convention , Salt Lake City. The Rev. Gayle Fisher-Stewart (VTS ’15) continues to work through the Center for Faith in Justice at Calvary Episcopal Church in Washington, DC which she founded with an EES grant. She has hosted a number of events at Calvary and developed a strong network of support within the Diocese of Washington and in the community. The Center will continue to hold workshops and seminars, to publish articles and to maintain a public witness for justice for all of God’s creatures, particularly people of color and those involved in the criminal justice system. Fisher-Stewart envisions a Church that gives more than lip service to justice and human dignity; her vision is for a church that works actively to dismantle systemic racial injustice. This innovative parish curriculum, launched by Forward Movement in April 2016, is the work of EES grantee Dr. John Hainze (Berkeley at Yale ’15). 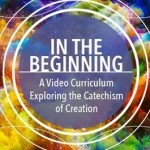 It includes video interviews with leading ordained scientists in the Episcopal Church, and a curriculum and leader’s guide, to use in offering the TEC Catechism for Creation to parish audiences. Hainze envisions that the program will strengthen the integration of faith and science for those who participate, and empower them to offer their integrated witness to others.